On Sunday, Chris and I were in Istaravshan. We asked an old man if he knew how to get to the 15th century mosque and madressa. He lacked teeth, but more than made up for that in character. He offered to take us to the mosque, and along the way a large group of pre-teen boys joined our little party. When we got to the mosque we met the care-taker, who informed us that some ruffians had stolen her key. Which happened to be the only key to this 15th century Timurid mosque. She suggested we hop in through a window. 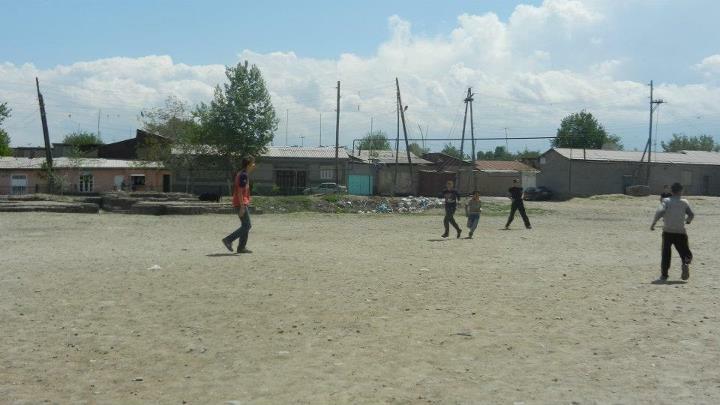 So that’s what we did- Chris, the old man, the group of pre-teen Tajik boys, and me. And then we climbed up the disintegrating stones steps of a spiral staircase- which clearly hadn’t been touched since the year 1500- to the minaret, where we all huddled on a tiny perch over looking some 500+ year old graves. And I thought: Holy crap, I never want to leave Tajikistan! I quickly came to my senses- I’m quite excited to go home in less than two weeks!- but it was a nice reminder about why I picked the Taj as a study abroad locale. In the spirit of adventure and cheapness, we decided to drive to Khijand, instead of flying (we flew back to save time). A driver who also took us to the Pamirs offered to drive us. We shared his car with an under-18 boys wrestling team, and their gruff coach. In the middle seat sat four wrestlers, and Chris and I shared the back of the jeep with another wrestler. We drove together for 8 hours, over an unpaved mountain pass that had been mostly washed away with the heavy rains this year and through the “Tunnel of Death,” where we got stuck behind a construction crew doing “pavement” work. It wasn’t the most comfortable ride I’ve ever taken, but then it definitely wasn’t the most uncomfortable, either (that was an overnight bus between Dharamsala and Delhi in 2009). The wrestling team wasn’t great at sarcasm. Chris and I convinced them that we ate hamburgers for every meal in the US, and that since pavement didn’t even exist in the US, the unpaved roads didn’t bother us. Everything they’d ever seen in movies was lies! We stayed at the Hotel Leninabad in Khujand (Leninabad is the Soviet name for Khujand). It is the type of place where a lost old man will wander over to your room at 9pm and ask your TV works. When you say yes (a bit of an overstatement, it gets 4 very fuzzy Russian channels), he asks if he can take it. And waddles back down the hallway, television in hand. It will probably not win any awards for comfort. It may win awards for best Soviet throwback, though. On Saturday Chris and I split up for a bit to go exploring independently. I musuemed for a while, and then walked across the Syr Darya to go find THE BIGGEST LENIN STATUE IN CENTRAL ASIA. I couldn’t remember how to say “statue” so I just asked strangers to show me where “Big Lenin” was. It worked. I met a young government worker (who swore he wasn’t corrupt), who offered to show it to me. Khujand was embarrassed about the giant 22meter Lenin in the middle of their city nearly 20 years after independence, so last year they moved it to a field slightly set back from the town. 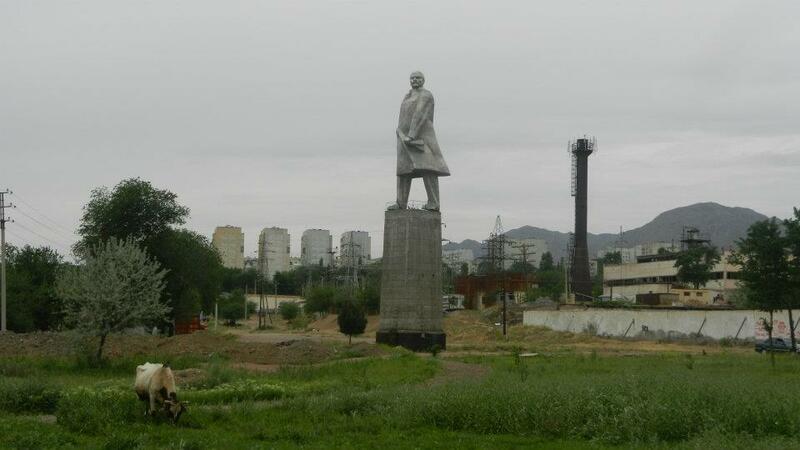 The tallest Lenin in Central Asia shared the field with a hungry cow and a couple of stay dogs. Biggest Lenin in Central Asia + a cow in a field. Him: “In Penjikent.” (That’s 6 hours away, assuming the road is good). After that, I took my leave and went back to meet Chris. Well, you’ve already heard about our mosque/madressa adventures. The other great thing about Istaravshan was its bazaar. Outside there were lots of live chickens. Inside, there were lot of old yogurt makers who let us sample their fresh yogurt (delicious!). The smells of a million kabobs. We went to the bazaar in Khujand too, and that was also wonderful. 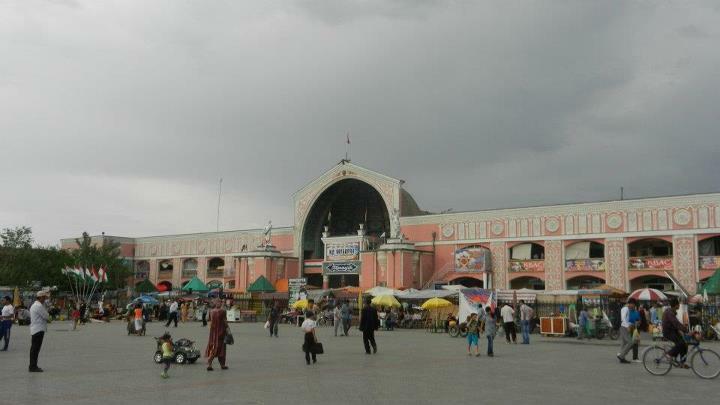 In fact, it is apparently among the best and largest bazaars in Central Asia, and was situated in a picturesque central city square. But I preferred the bazaar in Istarvashan. We ate a wonderful lunch of Tabaka (chicken grilled on a spit), in the middle of the bazaar. I asked if I needed to cover my hair while visiting the 15th century mosque. Our new friends said no, but then decided it would be hilarious if I wore the old man's hat. Later, we sat on a tiny bridge over the small, fast flowing river in the middle of town, and watched the afternoon and some goats stroll by. Chris also played soccer with a bunch of kids in the middle of the old town. Many of the kids insisted that I take about a thousand photographs. Quick flight on Somoni Air. Comfortable half hour spent on a 737. No teenage wrestling team. Back to Dushanbe in time to relax with my host family on Sunday evening. I cast my gaze upon the sea. 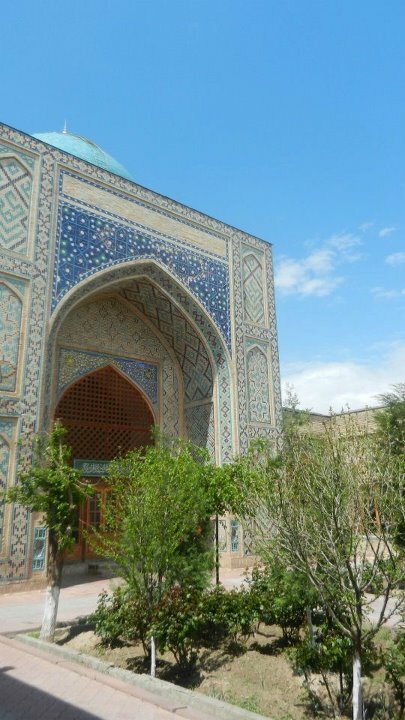 This entry was posted in Uncategorized and tagged Central Asia, dushanbe, Farsi, Istaravshan, Khujand, museums, Persian, Poetry, road trips, Study abroad, Tajiki, Tajikistan, Travel. Always enjoy reading about your amazing adventures. Have a safe trip home. You never sieze to amaze me! Safe travels back to the good ol USA!